Sometimes beginner and experienced beekeepers need a little extra hand with some on-site advice. Beekeeping can be difficult at times, as you try to make sense of what your bees are doing. We were beginner beekeepers once and we remember wondering if everything is going terrible or is everything going well. It is just hard to know sometimes, so we want to be available to help you be a better beekeeper. A routine hive inspection is essential to every good beekeeper. During a hive inspection, a beekeeper can find out how well the bees are doing and if any action are needed. We can help with your inspection and advise on next steps and show you how to do your own inspection. Varroa mites can wreak havoc on a bee hive, often going unnoticed until it is too late. It is practically impossible to just look for varroa mites on the bees, so we can offer a definitive count of the varroa mite population in your hive and give advice based on what is found. If you have a particular strong hive that you would like help splitting, we can help you find the queen and the right frames for the job. If you need to mark the queen before splitting or have queen cells that you would like transferred, we can help make that job easier for you. Splitting hives is a great way to keep your bees healthy and prosperous; as well as increase your apiary. When your bees arrive, it can be an intimidating process "installing" them. We can help demystify this process and coach you through the steps or you can watch us. Different techniques are used for packages and nucleus hives and we can help you and your bees get started on the right foot. Have your bees swarmed and you want to get them back? We can help you get your own bees back and transfer into a new hive. There are certain tricks we can share with you to ensure your new (old) bees stay in their new hive, turning lemons into lemonade. After a colony dies, it is helpful to look at the frames and make a diagnosis as to why they died. Sometimes it can be difficult to tell, but we can help diagnose the situation to hopefully keep it from happening again. What do you do with the equipment? We can help you find a plan for that too. Losing colonies is part of beekeeping, but we can help reduce the pain from that sting. It can be difficult planning the right spot for your bees, as there are so many variables to take into account. Choosing your apiary location takes carefully planning and prep to ensure you and your bees do well. If you need your hives moved to a new apiary, we can help with that too. Sometimes our schedules don't mesh well with our hobbies. If you aren't able to take care of your hives for a period of time, we can step in and help your bees while you are away. Whether that is feeding your bees are adding equipment to reduce the chances of swarming. If all goes well with your bees, you may be able to harvest a little honey for your friends and family. Not all frames are ripe for harvesting, so we can help go through your hive and pull frames that will do the job. And also help you uncap and spin out your honey. It's quite a process, but helpful to have an experienced beekeeper along side to help. Our on-site mentoring service is $60 per hour (plus additional travel expense if necessary) and many of our visits are able to be completed in about 1 hour. As soon as we arrive, well get started working for you so that we can get all your goals accomplished. We know your time and money are valuable so we make a point to be on time for our appointment, but if anything should arise, we will notify as soon as possible. We enjoy teaching and want you to be successful as a beekeeper and our mentoring service gives you the opportunity to work with an experienced beekeeper with your bees. We use the Galleria Mall in Hoover as a starting point for travel and are able to serve most of the Birmingham area without additional travel charges. To set up an appointment or if you have other questions, please feel free to contact us with any applicable details. 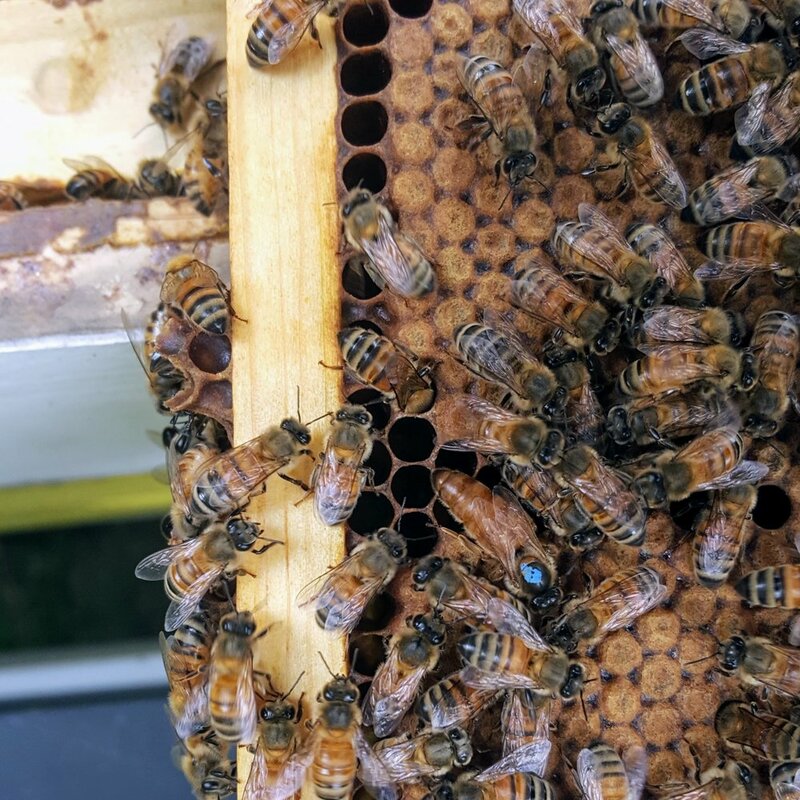 We also have a free service where we send a monthly email with details about what your bees are doing each month, as well as what beekeepers are doing each month. If you are interested and would like to sign up, enter your email address on the very bottom right of this page in the "Bees and Beekeepers" block.